Sherpa Helping member to cross Khumbu Ice fall. Photo Stew. 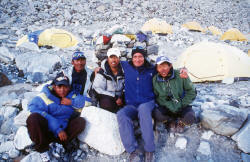 All of our full-service expeditions include sherpas for the group. We hire Sherpas and high altitude porters in a support capacity, and now have 23 of these very experienced, friendly, strong, helpful, and loyal people on our staff, including some of Nepal and Tibet's best climbers and some of Nepal's only women Sherpas. Some of our Sherpas have been to the summit of Everest more than 7 times. One of our lady sherpas just became the first Nepalese woman to reach the summit of Ama Dablam, Pumori, and Cho Oyu. Many of our sherpas have personally assisted foreign climbers to the summits of more than ten of the highest peaks in the Himalaya. During our expedition they will be carrying group equipment such as tents, rope, food, and gas. They are also there to assist in any rescues, so the other team members do not have to give up their summit attempt to rescue a sick member. Ang Sherpa and Ms. Sophie atop Everest. John Dowd and Tenji 1, Everest summit. Dr. Ken Stalter and Dawa Sherpa (they are on the right side of the photo) on the summit of Everest. Tenji 2 on the summit of Everest. Lakpa Sherpa and Mike Browder on the summit of Everest (Pasang Sherpa). Ang Sherpa and Ms. Sophie Denis (Daniel Mazur). John Dowd and Tenji Sherpa 1 (Daniel Mazur). John Shelton-Smith and Tenji Sherpa 2 (Daniel Mazur). Pasang Norbu and Ms. Linda Tan (Daniel Mazur). Dr. Ken Stalter and Dawa Sherpa (Daniel Mazur). Matt Lipscombe and Nima Chirri (Daniel Mazur). From left to right: Ms. Agnieszka Kiela-Palys, Cherring Dorje Sherpa, and Maciej Palys (Daniel Mazur). Phurba Sherpa and Andrew Brash (Daniel Mazur). Left to right: Dr. Christian Otto, Lakpa Norbu Sherpa, and Eric Otto (Daniel Mazur). Matt Lipscombe and Nima Chirri on the top of Everest. Tile and Jangbu Sherpa atop the summit of Lhotse (Sam Mansikka). 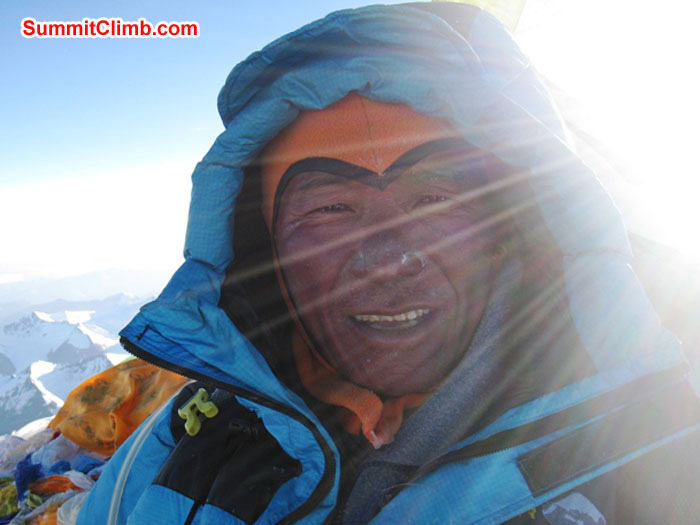 Lakpa Sherpa on the summit of Lhotse (Haris Kiriakakis). Arnold Coster and Maya Sherpa (They do a great job and we thank them!). Pasang Norbu and Ms. Laura Mallory. Mallory family: Front row l-r: Jangbu Sherpa, Ms. Laura Mallory, Sange Sherpa; Back row: l-r: Dan Mallory, Alan Mallory, Adam Mallory. Lakpa Sherpa and Mike Browder. 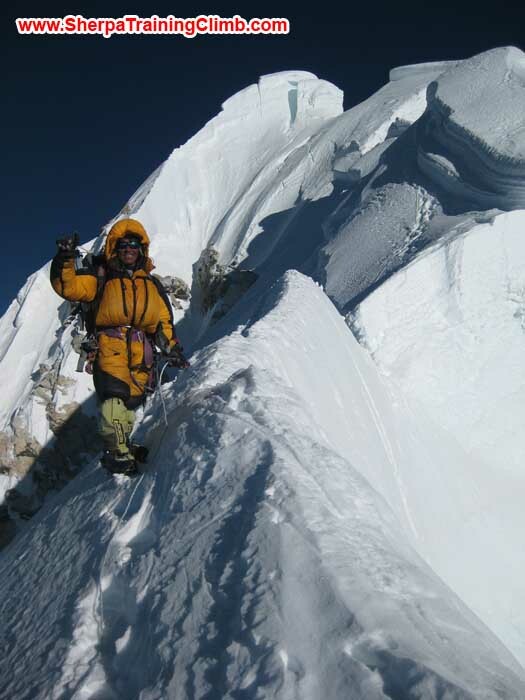 Jangbu Sherpa on his 14th summit of Everest. Photo by Scott Smith. Gyelje Sherpa fixing rope in the lower part of the grey tower. Checkout camp two on top of the yellow tower in the lower left. photo by Maaike Braat. Jangbu has climbed more than 12 peaks with us, and he is an accomplished climber, a real asset to our expeditions, and a very friendly and kind person. Our awesome Tibetan Sherpa team at Cho Oyu ABC at 5600 metres with Tunc (pronounced "toonch"). He is a strong friendly climber from Ankara. Here is what SummitClimb leader Phil Crampton has to say about the photo: "The names are from left to right: Wangdu (from Lhatze, Tibet), Tsering Dorje (Nyalam), Tashi Tsering (Shigatse), Tunc Findik (Turkey) and Aden (Shegar). Tunc has climbed Pumori, Broad Peak, Cho Oyu, Everest and guides on Elbrus. All the Tibetan climbers came from the Tibetan Mountain School in Lhasa and have climbed Everest at least once with Tashi making the summit three times. SummitClimb have been supporting the school since day one." We have been working with the Tibetan Mountain School to educate and train extremely strong and helpful Tibetan climbers, staff, and cooks. They have climbed Everest, Cho Oyu, Shishapangma, Mustagata, Nojin Tangla and many other summits together with us. They are not only adept and fearless climbers, but they are also learning to cook and their English is getting pretty good. They were born and raised in Shegar, Tibet, a town which lies above 4000 metres. These are students from the Tibetan High-Altitude Mountain School, in Lhasa, which we have been working with continuously since 1998. To learn more about the school, please visit: www.xixabangma.com. 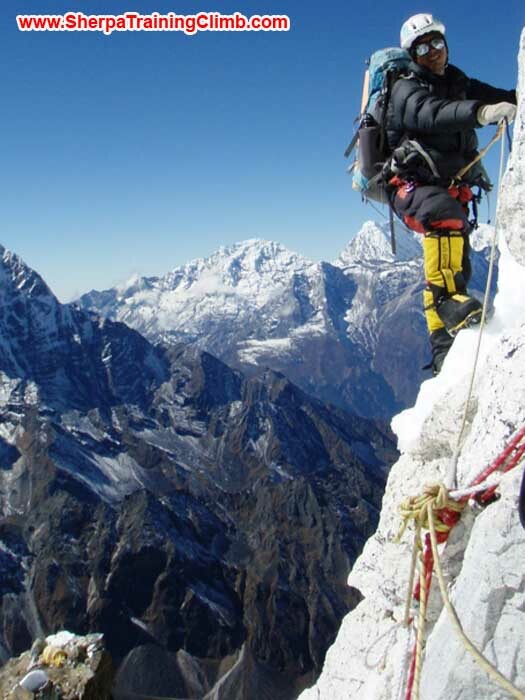 Durge is a 37 year old, multi-talented and well traveled mountain climber. He is a father and husband. He has reached the summits of Everest and Cho Oyu. He carried Imax movie equipment, strapped to his back, to the south col on Everest. He has been a member of Swiss expeditions. Durge helped to rescue a team of climbers from a winter ascent of Kangchenjunga. Durge is a real gentleman and an extremely professional sherpa. He speaks English, Tibetan, Nepalese, and Tamang. He has a deep understanding of the concerns of the western tourist, and is a very strong and talented climber. Kipa Sherpa, Five star cook. Kipa Sherpa, our expert cook, has taken classes at 5-star hotels in Kathmandu. He cooks three delicious hot meals each day in basecamp and advanced basecamp (Roland Debare). Our busy agency office in Kathmandu. The staff, working together as "Everest Parivar Expeditions, Pvt. Ltd." led by the experienced and influential Mr. Murari Sharma, are hospitality experts and have, for the last 21 years, been arranging overland tours, safaris, raft trips, treks, mountain climbs, trek support staff, cooks, peak climbing permits, satellite phone permits, video and film-making permits, translators, liaison officers, climbing Sherpas, oxygen, helicopter flights, air tickets, equipment purchase/hire, storage, import/export, shipping, customs clearance, transport bookings, advance hotel bookings, visas, repatriations, and permits (Photo: D.L. Mazur). Murari knows the mountains and peoples of his homeland well. He has trekked to: Everest-Nepal basecamp, Everest-Tibet advanced basecamp, Ama Dablam basecamp, and has trekked throughout the foothills and remote areas surrounding Mount Everest, inspecting health posts and schools for the Mount Everest Foundation for sustainable development in Nepal and Tibet. 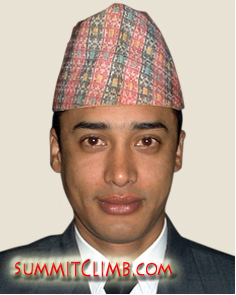 Deha Shrestha, logistics administrator, client-contact and staff-liaison from Everest Parivar in Kathmandu. 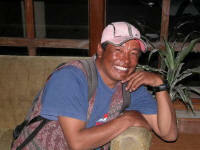 He has trekked to basecamp and done our Service Trek and is well traveled in Nepal and Tibetan border areas. 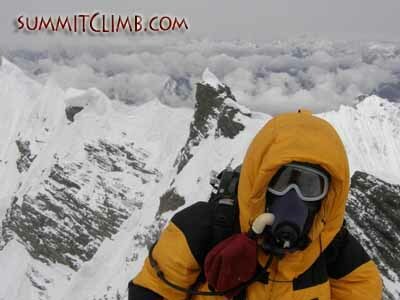 Please feel free to ask him any questions at info@summitclimb.com .